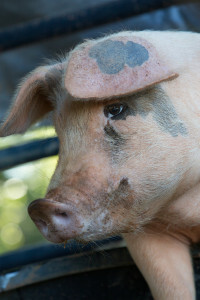 THELMA LOU arrived at Full Circle via a network of volunteers and rescue workers who were able to come to her aid after she escaped from a factory hog farm in Eastern North Carolina. PENNY was one of the original trio of animals who came to Full Circle from a desperate situation where they were in need of a good home and fast! Penny has a big personality and spends her days relaxing your mud hole and enjoying fresh produce. BABAR, our lovable handsome man, was being sold as a tiny piglet in order to become nothing more than flesh on a plate. Although Babar was just a tiny little piglet when he arrived, he has grown into a whopping 650 pound bundle of joy! 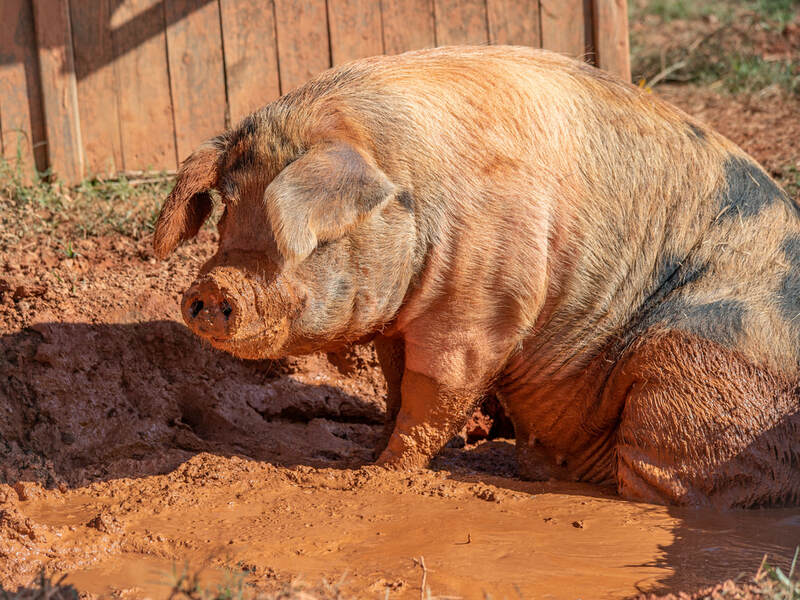 He really enjoys mud baths and interacting with people who come to visit Full Circle. Over time, he has grown a bit hard of hearing and sometimes needs a little extra 'nudge' when it's time to wake for the day and enjoy breakfast. EWA and her sisters, Olivia and Eleanor, had just been pulled from their mom at six weeks of age and were huddled together in a small crate, frightened and shaking, at a Columbus, GA Farmers Market. The farmer had them there to be sold for food. Several onlookers were about to purchase them and take them home. As the buyers quibbled with the seller about price - all the time laughing and talking about what tasty bacon and ham they were about to become - Ellen Jones stepped in to save the three babes from this terrible fate.